A lot of computer devices and gadgets uses USB connectivity to connect to the computer because it offers the convenience of immediately initializing the device, unlike the using the PS2 keyboard where it needs to be connected before Windows is started up to work. Other than that, most of time the USB device will work without even require to install a driver. Although convenient, USB also poses a security risk where someone can easily steal a huge amount of data out from the computer by just plugging in a really fast 128GB USB flash drive. Locking up the computer when you’re away from the computer should stop this from happening but you may never realize that there are times when you are careless and forgot to lock it. Fortunately Windows keeps a history of all connected USB device not for the sake of forensics but for performance purposes. Here are two free tools that reveals all USB devices that were connected to your computer. USBDeview is a simple and portable tool that offers tons of information on the USB devices that are currently and previously connected to the computer. If you want to look for connected USB flash drives or external hard drives, sort the Device Type by clicking on the column and look for “Mass Storage”. You can double click on the device to see the exact date and time of when it was first connected and the last time plugged in to the computer. Other than using USBDeview to check on all connected USB devices, it can also be used for troubleshooting USB connection problems. Simply right click on the problematic USB device and select “Uninstall Selected Devices”. Uninstalling the device will will cleanup the traces so that the USB device can be reinstalled automatically with the correct and updated settings. It is also possible to block the USB device from working in future by disabling it in the program. 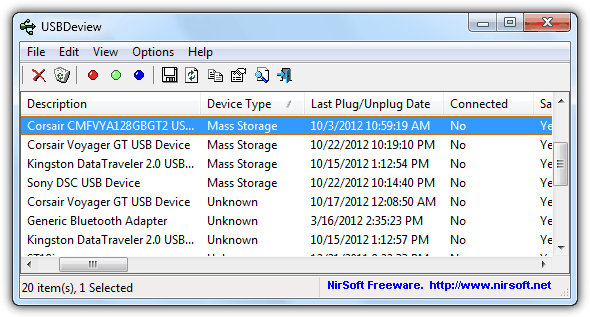 USB History Viewer is another free tool that is meant to only show the history of connected USB mass storage devices such as flash drive or an external hard disk. 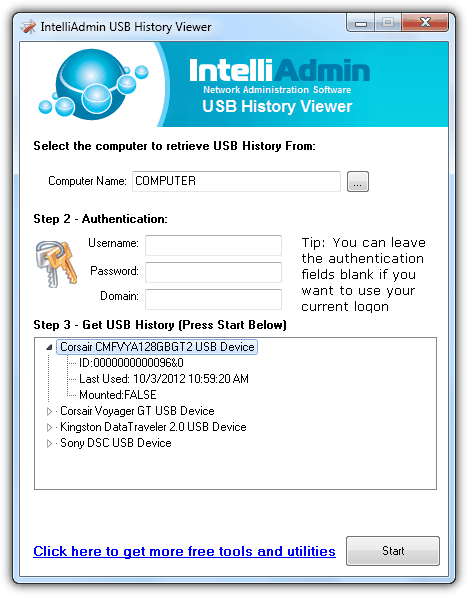 The advantage of USB History Viewer is it also support other computers on the local network if provided a valid authentication. Running this tool will by default show LOCALHOST for the computer name and that won’t work. You will need to either specify your computer name, internal IP address or alternatively clicking on the browse button to select your computer from the list. Once you’ve provided the computer name, click on the Start button and the history will be displayed in a few seconds. To download this tool, you will need to provide a valid email address and the download link will be sent there. Editor’s Note: Both of this USB history revealing tool are free and works on Windows XP to 7, both 32 and 64-bit. Advanced users would prefer to use USBDeview because it comes with a lot of options that a normal user would not use such as command line support, executing custom commands when a USB device is inserted or unplugged, and even the option of powering off the USB device when it is safely removed which is enabled in XP by default but not on Vista and 7. As for USB History Viewer, the functionality is limited other than the remote feature. This is not fool proof because the USB history that can be retrieved using either of the mentioned tools can also be erased.